Researchers say that the penguin fossil that is estimated to be 37 million-year-old should be taller than today’s biggest living penguins. According to the analysis made by La Plata Museum in Argentina, the researchers found that the penguins that lived before million years were as tall as a human. The larger body mass and height of emperor penguins have a great advantage in their living when compared to other smaller penguin species. They can swim underwater more easily and can stay in the water for long hours during hunting. Emperor penguins prey on squid, krill, and fish. They can dive deeper and reach the food source that cannot be reached by other marine animals or birds. They can dive up to 1800 feet and hold their breath up to 22 minutes. Emperor penguins have a tremendous ability to store oxygen in the body. They can also bear the low oxygen in the body along with the tendency to endure the effects of pressure. Palaeeudyptes klekowskii is one of the biggest prehistoric penguins that can be under water for nearly 40 minutes. Emperor penguins breed absolutely on sea ice and they don’t contact the icy land, they tip up the feet to avoid the direct cold. When we speak about endangered species, emperor penguins are near to the threat and not thoroughly under risk. Developments have been taken to conserve the species and enhance their living. The tall body has a lower part with a kind of bent pouch like facility called brood pouch can protect the chicks and eggs and keep warmer and comfortable. The plumage and the fat in the body keep them perfect for frigid Antarctica. Emperor penguins walk about 280 km to reach the sea and that ability is also favor because of the height and build. 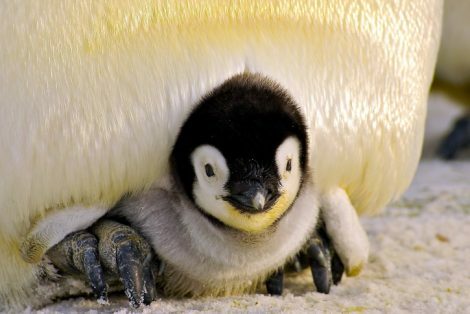 The emperor penguins chick weighs around 315 g after hatching. The males being quite taller than the females incubates the eggs for nearly two months to hatch. The taller body offers a less of contact to the ice. Emperor penguins have almost many common threats that other species of penguins face. The major threat that emperor penguins suffer is the climatic changes. Water pollution: The oil spills by the ships that travel in the habitat of these species harm them certainly. The emperor penguins being long hours in water for hunting intake the toxic oil and are under risk. The chemicals harm their organs and endanger the species and the progenies. Human habitat: Even though the Antarctic is not the preferred place for humans to stay, there are human site up made for research purpose. They in few ways affect the species and their habitat. Sometimes, the airplanes that pass nearby the colonies of emperor penguins upset the group leading to the huge hustle bustle. Due to the sudden havoc, the penguins experience serious injury and also death. The height and the bulky body of the species are a disadvantage during this scenario. The magnificent species’ predators are mainly leopard seals and killer whales. The eggs and chicks are targeted most commonly by Antarctic skuas. The bone fragments that were found in New Zealand are larger than any living penguin. They are not the same species of the emperor penguins. The fossils expose the size of the ancient species that was almost equal to the height of a human. The strong and long bones suggest the early evolution of penguins. They would have stood tall with the height of 1.65 m and would have weighed around 100 kg. When compared with the emperor penguins the ancient penguins are much taller and heavier. 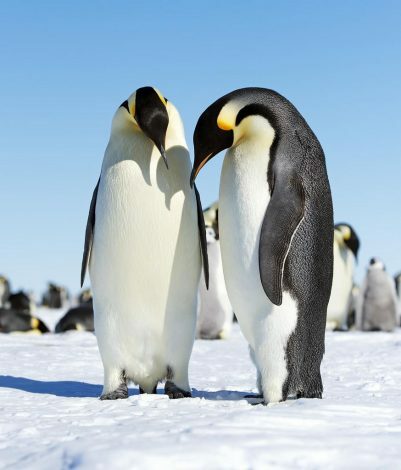 However, the history makes us surprised, the living cute colossal penguin’s species- the Emperor penguins, should be taken care to avoid extinction and decorate the world with its beauty. What Do Emperor Penguins Eat? Where do Emperor Penguins Live? How Long do Emperor Penguins Live?